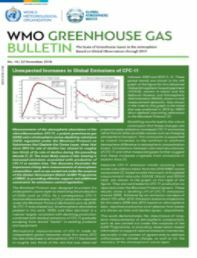 WMO Greenhouse Gas Bulletin (GHG Bulletin) – No. 14: The State of Greenhouse Gases in the Atmosphere Based on Global Observations through 2017 – available here. The latest analysis of observations from the WMO GAW Programme shows that globally averaged surface mole fractions(1) calculated from this in situ network for carbon dioxide (CO2), methane (CH4) and nitrous oxide (N2O) reached new highs in 2017, with CO2 at 405.5 ± 0.1 ppm(2), CH4 at 1859 ± 2 ppb(3) and N2O at 329.9 ± 0.1 ppb. These values constitute, respectively, 146%, 257% and 122% of pre-industrial (before 1750) levels. The increase in CO2 from 2016 to 2017 was smaller than that observed from 2015 to 2016 and practically equal to the average growth rate over the last decade. The influence of the El Niño event that peaked in 2015 and 2016 and contributed to the increased growth rate during that period sharply declined in 2017. For CH4, the increase from 2016 to 2017 was lower than that observed from 2015 to 2016 but practically equal to the average over the last decade. For N2O, the increase from 2016 to 2017 was higher than that observed from 2015 to 2016 and practically equal to the average growth rate over the past 10 years. 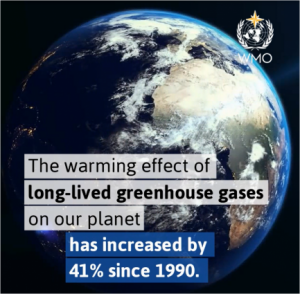 The NOAA Annual Greenhouse Gas Index (AGGI)  shows that from 1990 to 2017 radiative forcing by long-lived GHGs (LLGHGs) increased by 41%, with CO2 accounting for about 82% of this increase.